Texas Gun Show Review publishes profiles of gun show vendors in an effort to get them ‘out from behind the table’ and in front of the public. Profiles are published free of charge and all text is provided by the vendor. Comments and views expressed are those of the vendor and not necessarily of Texas Gun Show Review. Although many people in this business started with firearms at an early age, I actually did not buy my first handgun until after my children were born. I have to confess to spending some time in places that you should not go unarmed. Even though I take every possible precaution as a father, it was pretty obvious to me that I needed to take extra precautions to protect myself in order to ensure my children always had a father. And, I felt it was paramount to be able to protect my family. The first gun I ever owned was a Mossberg Cruiser 12 ga. Somehow, I thought a 12ga pump with a pistol grip was the ideal home defense weapon for my wife and me. After she shot it one time, she demanded I get rid of it. Now, like so many people, I got my early firearm advice from movies, so I decided to walk into Bachman Pawn & Gun and purchase a Beretta 92 from ‘Lethal Weapon.’ Well, there was a felony car stop outside the store and one of the perps jumped under my van, so I could not leave the store. A cop came in to secure the store, so I asked him what he carried. Within about 30 minutes, he sold me on Sig Sauer. But, I was hooked! I grew up in my father’s workshop, so the transition from woodworking to gunsmithing was a natural one. Since it was possible to reach out online to firearm owners, I decided to start my business as The Sig Armorer. I obtained my armorer’s certificate in 2008 and my FFL in 2010. As of this writing, I am nearing the 1000th entry in my log book! 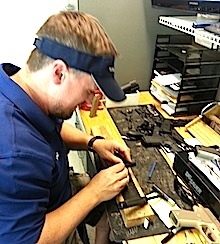 Although I specialize in Sigs, I also work on 1911’s of any make and model as well as all AR platforms. I do customization only on these platforms, although I offer maintenance and repair service for almost any firearm in the industry.